Up front with this post I feel compelled to point out that I hadn’t eaten much before we went out to dinner so by the time our meals arrived I was starving. Therefore my attention was off for this one and I may be missing some details, but I will try my best. Different cuisines have differing levels of ‘public consciousness’. By this I mean if you stop the average man or woman on the street and ask you to tell them what they know about a type of food, they will be able to rattle of some standard items. If you were to do this with Thai food, there are a few standards: Phad Thai, Thai Fishcakes, Thai Green Curry. The recurring theme here is the fact that you rarely come across a cuisine which self references in the way that popular Thai dishes do. Despite this, there still isn’t really a great deal of public consciness around Thai food and certainly not of the great quality and variety of flavours it can offer. I have to be honest and say that I got a bit of a reminder of this myself recently at a restaurant called Thai Spice. 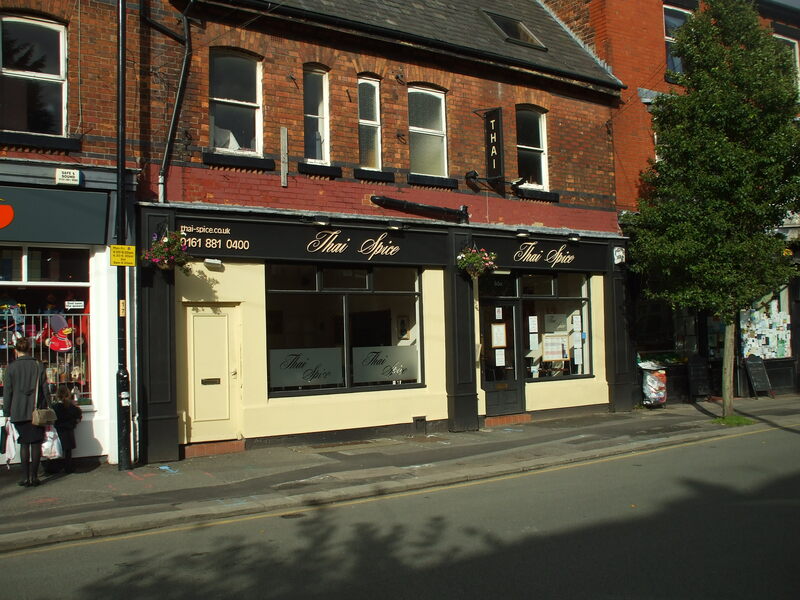 Thai Spice is a little restaurant on the end of the uber-trendy Beech Road in Chorlton. Home to some interesting little eateries and cafes, this is one place I’ve never set foot in despite having been intrigued by it. The small space creates a cozy atmosphere and a warm welcome at the door always helps. After being seated, we were straight down to the food and drinks (as I stated earlier, I was quite hungry). Being with friends who were willing to operate a share and share alike policy, we all ordered and shared. I picked out the Phad Prik Khing, which has a Thai Red Curry base. Years ago I went on a Thai cookery course when I was in Chaing Mai and while I forgot most of it, I do remember the difference between Green curry paste and red curry paste. Its the chillies; Red uses dried red chillies and green uses fresh green chillies. So this dish had some kick to it. The kick was well offset by the sweetness from the sauce.Another little piece of retained knowledge I kept from that cookery course was the use of sugar. Unlike in parts of India where creams are more commonly used to balance the spice in dishes, Thai cooking commonly uses sugar as the key ingredient to do this, with cream added for flavour. The downside of this can be syrupy sweet Thai curries, a trap that was well avoided here, The green beans were fresh and crunchy and while the beef was too thin and flimsy for my liking, this dish was well-balanced and delicious. Having done a number on my own dish, I prowled the table for my next target. I came upon a a cod dish which I have since been unable to identify on the menu and would appreciate some assistance in identifying. As a sidenote, one of the reasons that I’m not really cut out for the food reviewing game is that I’m just there for the food. The idea of sitting and taking notes, takes the fun out of the moment. The downside is that I forget some of the details… I may have to start stealing menus. Now add into the mix the substance of the meal. Sticky rice is something I usually don’t go for as I have a massive boiled rice addiction (I just bloody love the stuff), but on this occasion someone ordered some for the table, Presented in a small wicker basket and still wrapped in its steam bag, it was a great example of the side dish. Flavoursome, glutenous to the right degree and well bonded enough to required a spoon to scoop up a chewy clump of lightly flavoured rice pillow. After the polishing off of the mains, the dessert menu came to us. Normally most South-East Asian restaurants don’t have interesting dessert menus, in the same way you wouldn’t really expect to peruse the burger menu at a Belgian patisserie. It’s just not really its key selling point, but today something caught my eye. The Chilli ice-cream had to be tried. Chilli ice-cream in large amounts – cause and cure of ice-cream headaches all-in-one. The flavour had to be tried and the result was interesting. The cream tends to hide the spice up front so at first it tastes like a strawberry ice cream. Once it’s passed the back of your mouth, the spice sneaks in and kicks your tonsils on the way down. It’s a pleasant tingle at the end of a cold hit and the ice cream quality itself was of a good standard. My only issue was the size as I was struggling to get anyone to share this thing with me, I once again had to declare defeat to this dessert (as with my last post, this is becoming a bit of a habit of mine). I’ve never been that favourable to Thai curries in general, either here or in Thailand as the sweet and chilli flavours are a bit hit and miss with me. On this occasion, they hit and I’d certainly give this place another go, just to find out what the hell that cod dish was. Christmas is nearly hear and I was trekking through the Trafford Centre on an obligitory death march or ‘shopping trip’, whichever floats your boat. 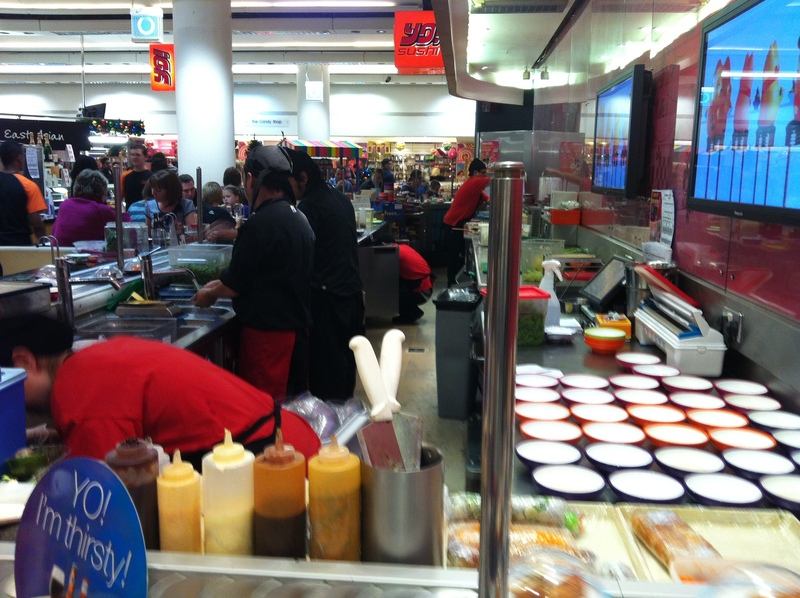 On the way, we decided to drop in to Selfridges for some Saturday shushi at Yo! Sushi. The sushi chain opened in 1997 in London to very favourable reviews, not only for good quality sushi but becasue who wouldn’t love a restaurant where your food moves round on a tiny conveyor belt. On a side note, I do sometimes wonder if they would have to close if that belt broke down. I’m not sure it would be the same to just have your sushi ‘handed’ to you. Regardless, we plowed through a mix of sushi and sashimi and other bits and pieces. The Inami Pockets were a great little start with rice and pickled radish surrounded by a fried soya bean roll (inami) which was sweet and sour in the right amounts. 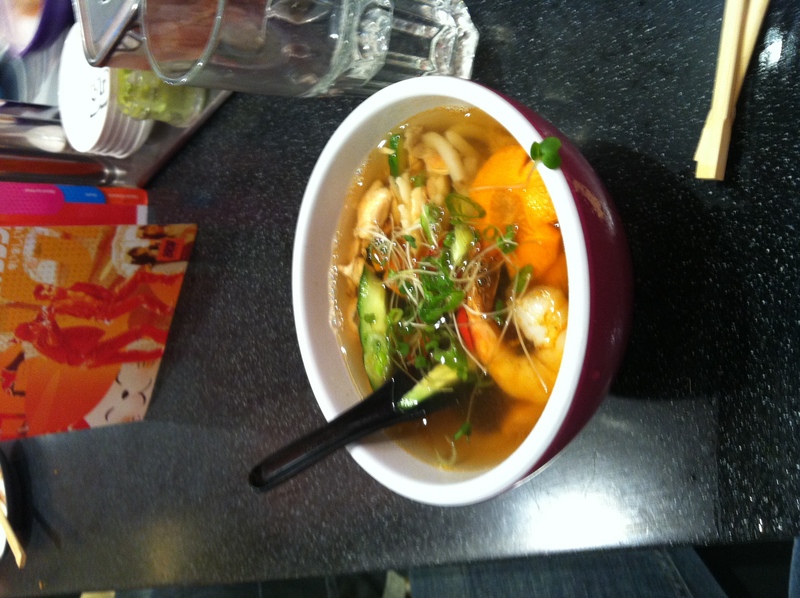 A spicy seafood udon soup had a great spicy tinge to the king prawns and squid cushioned on top of the thick udon noodles. The prawn katsu curry had the reliable comforting katsu curry sauce with fried prawn topped with tangy japanese pickle. From the sashimi menu we went with the classic salmon, which was a little on the bland side but more than made up for by the beef nigiri we had next. The crispy salmon skin ISO (inside out) roll was saltily good and a strong case for more use of salmon skin in dishes other than sushi. Before sushi fatigue set in, we made it to just one last dish of a crab hand roll and what a way to end. Tempura fried crab, rocket, more japanese pickle and a sweet chilli mayo wich proceeded to leak out onto my hand. So that happened a few hours later. 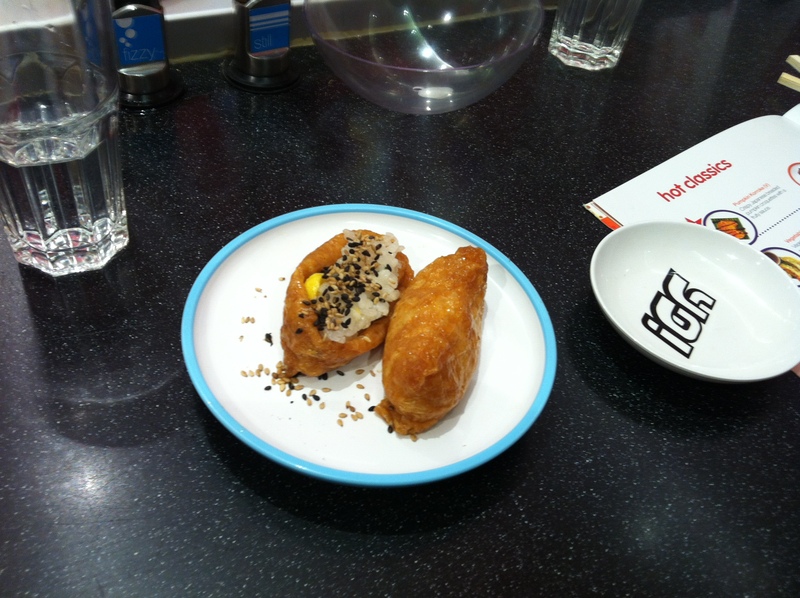 This time we were in Tampopo sampling pan-asian cuisine. I hate that phrase ‘Pan-asian cuisine’ as it sounds strange in my brain, like the sound of a cat clearing its throat or listening to Enya. Its not wrong, just weird. 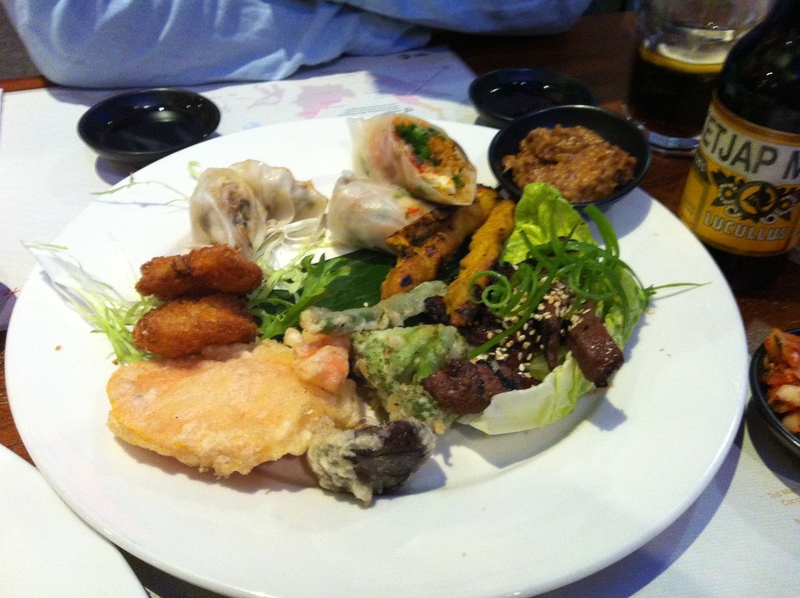 Given that we’d already eaten, we went for a Tampopo Platter to Share. To cut down on the explination time, here’s what’s on the platter Goi Cuon (Vietnamese spring rolls), Gyoza (Dumplings), Bulgogi (mmm…beef), Coconut Prawns, Satay Chicken & Tod Man Khao Pod (sweetcorn cakes. The mix was amazing, six mixed starters and six sauces. I loved this dish more than I thought I would. The up-market, street restaurant style has a strange mix of trendy and traditional; the plush cushions on wooden benches is the best example of this. The decor was secondry though as this platter disappeared in about four minutes flat. Not bad from two people having their second dinner of the night. Double dinner took us across the Asian continent. Now all I need is a balti and I’ve got a full house. Next time: Triple Dinner?! ?